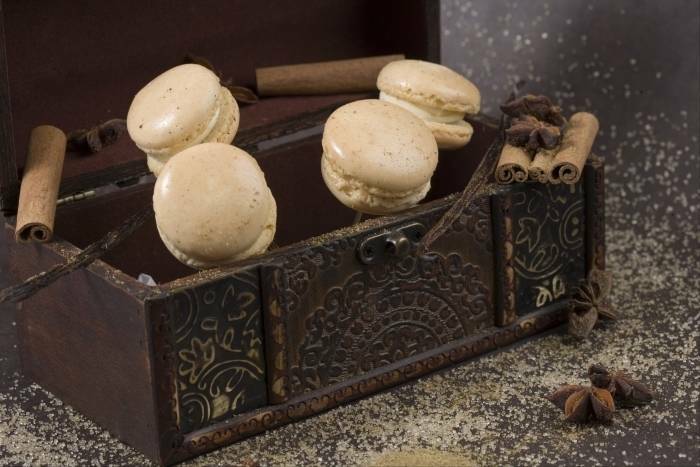 Delicate French pastries made with ground almonds filled with a cinnamon and 5 spice cream. Place the icing sugar and the ground almonds in a blender and blitz to obtain a fine powder. Add 2g of 5 spice powder and pass through a sieve. Whisk the eggs whites until thick and then mix in the sugar. Fold in the icing sugar and ground almond mixture and then add the vanilla seeds. Gently beat the mixture using a spatula until you have a smooth, shiny and elastic mixture. Place the macaroon mixture in a piping bag. Pipe the macaroons on to a lined baking sheet. Leave to rest at room temperature for 15 minutes then transfer to the oven and cook for 12-15 minutes. Add the vanilla pod to the milk and bring to the boil. Beat the egg yolks with the sugar, cinnamon, remaining 5 spice powder. Add the flour, mix well then add the hot milk. Return to the pan and cook for 3 minutes from boiling point. Pour the filling in to a baking tray lined with cling film and chill in the fridge. Place the macaroon filling and the softened butter in the bowl of a food processor. Mix well. Stick two macaroon shells together with a generous amount of filling and serve.